I’m a movie and TV dork. I grew up watching classic Star Trek and Star Trek: The Next Generation with my parents. My two favorite shows as a preteen were GhostWriter and the Where in the World is Carmen Sandiego game show. And I’ll never forget one of my favorite philosophy professors in college, who showed us Gattaca and The Legend of Bagger Vance and helped us think beyond the obvious to get at the hard questions about life inside them. My daughter, Sarah, by her early teens was 10 times the media junkie that I was at her age. She watches literally hundreds of movies a year – probably close to one a day or more on average – and has watched her way through dozens of TV series in their entirety. And that passion has fueled so much of our family’s learning. It goes beyond the obvious, too. Sure, she’s picked up a ton of history through films like Lincoln and Defiance, and about the space mission through From the Earth to the Moon. What about what she’s learned from The Matrix? The Wolverine? Mission: Impossible? Sherlock? She’s picked up just as much from those, and that’s why it’s been so important to me to get on my soapbox and talk about all the ways that learning from movies and TV happens in our home in this ultimate guide. Homeschooling parents who want to incorporate educational movies into their curriculum. Unschooling or relaxed homeschooling parents who want to find ways to better connect with their kids during movie times. Parents who secretly or not-so-secretly feel like their kids waste too much time in front of a TV screen. Parents who secretly or not-so-secretly feel like they waste too much time in front of a TV screen. That’s a big list, right? Mostly, I encourage you to read through and see the types of things that movies and TV shows have helped engage our family in learning and discovering – even if the specific movies we choose aren’t ones your family wants to see! Let me be clear: We are radical unschoolers. One facet of that is that we don’t divide resources into “educational” and “non-educational.” We learn from life, and everything we do gives us the chance to talk and grow as a family. Yes, even “dumb” movies open up cool conversations! We also aren’t particularly restrictive about our family media consumption. We believe that listening and watching are not the same as espousing. You can watch Die Hard and not, you know, blow up helicopters. I also am just not a fan of how the MPAA ratings are handed out – there are some PG-13s that make me cringe and some Rs that I think are fine for even preteens with parental engagement – so our movie choices come from a wide spectrum of ratings for violence, profanity, sexuality and other maturity levels. You know your kids. You make the best decisions you can about what your crew will watch as a family. This guide is primarily focused on movies that might interest middle- and high-school-aged students (say 12 and older), but not exclusively. It includes some movies that you’d traditionally find to be “educational,” like biopics and documentaries, and a lot that you might not. It’s heavy on philosophy and history and medical science and social issues and music, because that’s what we’re into. And most importantly, it’s really not meant to be a film list nearly so much as it is meant to be an idea list. Use our suggestions as a stepping-off point into discussions on your family’s favorite shows and movies. What philosophical questions do they bring up? What social issues can you discuss? What artistic choices make the movie what it is, and what might be different without those? That’s what I hope you leave this guide with: An idea about ideas. Thoughts on how to think about movies. And most importantly, a new appreciation for the cool things that come when you sit down as a family in front of a TV screen and leave the real world behind for a few hours. Let me warn you: I’m not even going to try to sort this list. The cool thing about our life is that we don’t really focus on “subject areas,” so a historic biopic is just as likely to lead to a conversation about current social issues as it is history. The less-cool thing about that is it doesn’t lend itself to a neatly organized list. The Matrix trilogy: This series sparked Sarah’s interest in philosophy, and she’s since delved super-deep into existential questions about reality. We also talked about whether we’d want to live in a “perfect” world and what utopian and dystopian fiction are. Defiance: This is in some ways the most “obviously educational” movie on our list; it’s the story of the Bielski brothers, who led a Jewish resistance camp in the forest during World War II. Interestingly, Sarah originally wanted to watch it because it stars Daniel Craig of James Bond fame, and it ended up sparking a huge interest on her part in World War II. Valkyrie: This is another vote for “If your kid has a favorite actor, watch all their stuff.” Sarah loves Tom Cruise, and she had gotten into World War II after seeing Defiance, so this look at a failed assassination attempt against Hitler also caught her eye. We talked a lot about whether Hitler “deserved” to die, whether he was mentally ill, whether it was right for people to try to kill him, and a lot more. Wild, Wild West: OK, hear me out on this. This one is cool because it gave us a chance to talk about what isn’t real and true historically, which naturally led us to talk more about the truth of western exploration. Also, Sarah says, “I learned you shouldn’t watch this movie a second time. It’s funny… once. The second time is a mistake.” GOOD LEARNING. Monty Python and the Holy Grail: This is another cool entry in the “what’s true vs. what’s not” vein. Plague in England? Yes, but not until later. Knights laying siege to one another’s land? Yes, but not with diatribes about coconuts and swallows and certainly without Trojan Rabbits. But we did talk about the Trojan Horse! Demolition Man: We definitely have a futuristic bent in a lot of our movies, and this one like many others led us to talk more about utopian and dystopian culture, morality standards, consumer culture, the prison system, rehabilitation of inmates and more. The National Treasure movies: These were cool, because not only did we get to talk about a lot of historical concepts, like rituals of Native Americans, the assassination of Lincoln and the signing of the Declaration of Independence, we got to talk a lot about places we’re actually familiar with (Philadelphia, Washington D.C., Mount Rushmore) as well as places we’re interested in but haven’t visited yet (Buckingham Palace). It was also cool to talk about codes, secret societies, what would happen if you DID try to kidnap the president and more. The Night at the Museum trilogy: This was another great series for sparking our interest in figures from history. Sarah learned about Atilla the Hun and Sacajawea and Theodore Roosevelt, and she also was the first to correctly identify a major natural disaster depicted in the third Night at the Museum movie (because she’d gone with her dad and grandmother to a museum exhibit about Pompeii a couple of years ago). She end up telling us a ton about what happened there. Fight Club: Ohhh trippy! Much like when we watched The Sixth Sense, the biggest thing I wondered was whether Sarah would “get” the twist about this movie before the ending. We talked about concepts like escapism, consumerism, addiction, self-harm and a bunch of other serious stuff as well as the existential “Who are you, really?” questions. 12 Monkeys: More of Brad Bitt acting insane. (Sarah really seems to like this about him.) Here we talked about different schools of thought in time travel – if it’s possible to change the past, Back To The Future-style, or if the past is more like a library you walk through, where you can gain information but not make changes. We also talked about protest movements, mental health care and the dispersal of viruses, which related nicely to our interest in the Plague Inc. app. Come on, it’s a movie-themed post! You knew there would be an intermission. Get up, stretch your legs, and make sure you leave your family’s favorite movie and one surprising topic you discussed or learned about from it in the comments of this post. Also, the last item, comparing 12 Monkeys to Plague Inc., reminds me of a point I wanted to be sure to make. The value of movies and TV shows in learning is connection. I don’t recommend sitting your 10-year-old down in front of Schindler’s List and going to make dinner. And I don’t recommend watching movies of any kind – even Disney animated classics – without overtly drawing parallels to other experiences. I love it when a movie we watch leads to a discussion about books we’ve read or places we’ve been or art we’ve seen. I love when we go to an art museum and are reminded of a movie. And I love it when a movie or TV show inspires us to go beyond it – to visit somewhere new, or think of the world in a different way. RENT: This was a serious one. We talked about the AIDS epidemic in America, how people with AIDS were perceived in the ’80s and ’90s versus today, what AZT does, drug abuse, gender roles and probably a bunch of other stuff I’m forgetting. If you have mature kids who can deal with these kinds of issues, and you’re willing to get honest with them, this is an incredibly moving and interesting movie. The Phantom of the Opera: Sarah was so interested in the Phantom story that I’ve got a whole separate post on this topic. Even cooler, earlier this year we went to see this show on Broadway. AMAZING. Lots to talk about here, from social issues (Do mistreatment and abuse “make you bad?”) to French culture to opera to ballet to how Broadway shows work to why certain TV or movie adaptations of literary works diverge from the original text while others don’t. Les Miserables: This was great! We got into this because Sarah loves Hugh Jackman as Wolverine. (We also watched his version of Oklahoma as part of our musicals kick.) This is another one I’ve written about separately in detail. Into the Woods: We got a kick out of this movie. Among other things, as a family we’re pretty into fairy tales, so we talked about storyline mashups, what other stories we’d like to see included, being careful what you wish for and more. Sweeney Todd: Interestingly, we talked about food production rules (like health inspections) a decent amount after watching this movie and seeing a stage musical adaptation. We also talked about the snake-oil salesman phenomenon and how old-fashioned barbering was done (with straight razors). The Fast & Furious series: We talked a lot about family while watching these, as well as the “gray areas” between legal and illegal actions (especially when it depends on who’s doing them). We also talked about physics – both the real physics of car racing and drifting and the not-as-real physics of The Rock popping a plaster cast off by flexing his muscles. Live Die Repeat: Edge of Tomorrow: This was definitely an installment in our “time travel and future science” collection. We talked about the comparisons with Groundhog Day, what it would be like to repeat something over and over, how computer viruses work, how knowing something in advance isn’t always good and more. Groundhog Day: We like Bill Murray, so this was fun. In addition to the basic “reliving the same day” concepts, we talked about Groundhog Day itself, since it’s a Pennsylvania holiday and all, the ways in which sometimes an outcome is just predetermined no matter what you do to try to change it and how we perceive time. Bruce Almighty: Besides the fairly obvious spiritual issues – what would you do if you met a diety? D’you think you can do a better job? – we talked about why bad things happen, how you can and can’t act at work, whether people “get what they deserve” or not and more. The Rush Hour trilogy: After watching these, not only had we talked about Chinese art and artifacts, we also researched Jackie Chan’s life and learned about Hong Kong’s geography and culture. Fortress: We talked a lot about reproductive rights – including where in the present-day world your ability to have children is limited by the government – after watching this. We also talked about prisons, torture, abuse of power, abuse of technology and more. Equilibrium: This is a COOL movie. I particularly recommend comparing it with 1984 or Brave New World. We talked a lot about what makes you a human, the role of emotions, the government’s control of your health and what it means to love someone. The Back to the Future trilogy: We’ve talked about this separately too. But some key topics are time travel, pride, bullies and predictions for the future. Lincoln: Sarah wanted to go see this at the movies when she was maybe 12 years old, and I honestly thought she’d be bored. She ended up liking it more than we did! 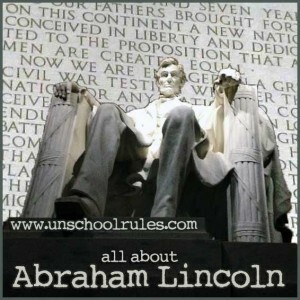 Check out some of our Lincoln thoughts and ideas here. A Knight’s Tale: This was another Wild, Wild West, in that we learned a lot about how this film does not relate to medieval times. Also, the start of the movie is priceless and will, hypothetically, kill any history buffs watching it with you who didn’t know what to expect. But seriously, you can talk about who Chaucer really was, what blacksmiths do, the Nike logo, and more. The Hunger Games series: This is another case where we talked a lot about dystopianism. We also talked about resource shortages, the power of the media, how clothes create a persona and how dictatorships work. The X-Files: Fight the Future: This was cool. We found a bunch of places on the map, like Tunisia; we talked about genetically modified crops; and we talked a lot about life outside earth. We actually talked about this a lot when we watched the Men In Black movies, too. I’d taken a Coursera astrobiology course last year, and that got me fascinated on the topic of how life might exist beyond our form of it. Sherlock: We binge-watched all of this show. (We like Benedict Cumberbatch a good deal.) We talked a lot about Sarah’s interest in forensics, about how Sherlock makes the deductions he does, about social skills, about friendships. Community: Sarah said this has shown us a lot about how to work as a team. We’ve talked about acceptance, about stereotypes, and about finding your place in a group. We also have talked about being yourself and not changing to please other people thanks to this. The Last Samurai: Sarah was interested in this Tom Cruise movie because, well, Tom Cruise, but also because we have an interest in Japanese culture. She liked talking about the main character’s journey to become like the samurai who had originally captured him and how he came to be part of their group, not a prisoner. We talked about how rare that would be (and about what Stockholm syndrome is, tangentially) but also how cool. Top Gun: More Tom Cruise. This time, he’s flying planes, and Sarah learned more about how that works, which is particularly interesting in that she’s never flown on a plane. She also learned that Cruise has a legit pilot’s license and does his own flying in real life. My Neighbor Totoro: We talked about how parents raise their children, how families deal with an illness or a hard time, and most importantly, how we all want a cat bus. (If you don’t know what this means, you need to watch this movie.) We also talked about how giving a gift isn’t always about the “value” of the gift nearly so much as it is the thought behind it. Spirited Away: This was another Hiyao Miyazaki/Studio Ghibli movie we love. It’s also a look at parenting (a big theme in the Miyazaki films), at the value of your name, at taking care of the earth (another Miyazaki theme) and at how to listen to what someone really needs. Big Hero 6: We love this movie. It gave us a chance to talk about what it means to work up to your potential, the value of (and the potential to misuse) technology, real-life advances in healthcare (especially robotically), grief and commercial applications of science. James Bond movies: I truly could not begin to list the things we’ve learned about based on James Bond, from geography (we look up almost every place Bond goes on our giant map) to ethics to physics to how cardiac arrest happens and how to stop it. I’ve written pretty extensively about this in past posts here, here and here</a). The Vincent Price adaptations of Edgar Allen Poe: Twice-Told Tales, The Comedy of Terrors, The Raven and Tales of Terror are among the adaptations Sarah has watched. She loves Poe’s work and we’ve talked a lot about these, which are almost to-the-word true reflections of the text in some cases. We’ve talked about the darkness in Poe’s work, she’s memorized large parts of The Raven, and we’ve discussed the effect Poe had on other mystery and horror writers. Star Trek: ALL OF THEM. Sarah has watched some of the original series and all of The Next Generation, Deep Space Nine and Voyager, and has started watching her way through Enterprise. She’s also seen most of the movies, and loves the new Chris Pine ones. This is another series where I can’t even get into all the topics of history, culture, geography and more that we’ve talked about, but you can get the start of an idea here. Among the more unique conversations we’ve had have been about how different species reproduce, what it means to be human vs. part of a collective like the Borg, whether various creatures have a soul, how a society without money would work, how replicators work, what teleportation might mean and more. Teach With Movies: This site actually gives lesson plans for movies on a variety of topics, even breaking down what particular segments of a movie go with the selected topic (like learning about black holes from the 2009 Star Trek movie). World War 2 movies to watch with your kids: Ticia from Adventures in Mommydom shared this list at movies for various age groups. Movies to learn about the Great Depression: This is another great list from Ticia at Adventures in Mommydom. 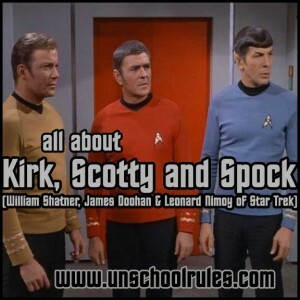 Teaching with Star Trek: Amy at Milk and Cookies has an amazing four-post series on teaching Ancient History, European History, 19th Century American History and 20th Century American History using Star Trek. This is seriously one of my favorite looks at learning from media, because it isn’t focused on just “educational” TV or movies. How many tribbles? OK, this is a very specific one, but I love Star Trek so much I had to add it. It’s a look at how many tribbles there were in the Trouble With Tribbles episode of the original series, calculated out. You’re welcome. The Complete History of England – in movies: This is hilarious. It takes a look at popular films featuring British history and riffs on what’s accurate and NOT in all of them. Starting with our favorite, Monty Python and the Holy Grail. How could you go wrong? List of historical period drama films: This list on Wikipedia is… lengthy. But cool. The History Channel Classroom: This one is kind of a gimme. It’s a look at The History Channel’s educational programming, with lesson plans and showtimes. Mathematics in Movies: From Harvard, no less! A whole ton of math-ish movies. Some you’d expect (A Beautiful Mind), some you wouldn’t. The Mathematical Movie Database: Also a cool list showing not just “movies about math” but the math in popular movies. Movies that Help to Teach Science: Ph.D. David Brin shares his list, which is pretty sweet. It ranges from science history – Apollo 13 – to biopics to fictional movies like The Andromeda Strain. 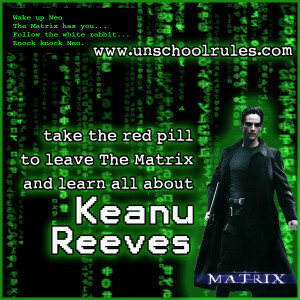 We happen to talk a ton about learning from TV and movies here on Unschool RULES. I’d venture to say most posts include either a show, a film or a video game we love! But if you’ve missed any, here are some highlights. To the moon and back: Best resources for space and solar system study: This list includes a bunch of movies and TV shows we loved. 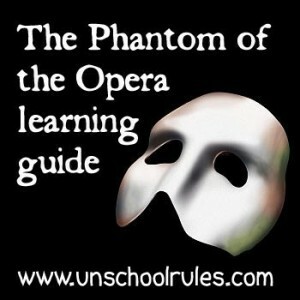 The Phantom of the Opera is there… inside our minds: We love musicals, as I mentioned above, and this guide stemmed from Sarah’s watching of a filmed performance. Monthly unschooling wrapups: We post these at the beginning of each month, just listing some cool things we did the month before. A big part of this is a movie list, so you can keep up with what we watch! This post is part of the iHomeschool Network’s Ultimate Guides series. Click the image below to see great tips from some of my fellow bloggers on a ton of cool topics! 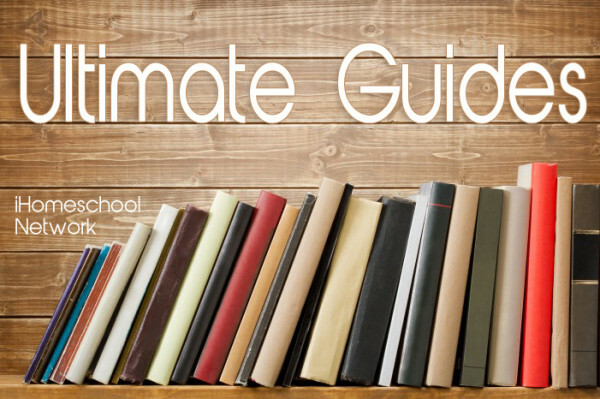 You can also check out the Unschool Rules ultimate guides from previous years: The Ultimate Guide to Homeschooling for Working Moms and The Ultimate Guide to Homeschooling and Unschooling in Pennsylvania. This post is part of the Finishing Strong linkup, which focuses on homeschooling middle and high school. This entry is about curriculum, history, homeschooling, math, movies, parenting, philosophy, science, technology, unschooling. The previous post was DragonBox: A beautiful and fun way to explore algebra concepts. The next post is Unschooling: Our April 2015 adventures. This is great, not just the Movie/ TV List, but but the summary of how each one can be/is educational. And I LOVE the “More Resources” part. Joe, thank you so much! More than any specific movie recommendations, that was really my goal: to tackle the topic and get people to think differently about movies and media! I’m so glad you liked it! First of all, I love your blog. Second, great post! 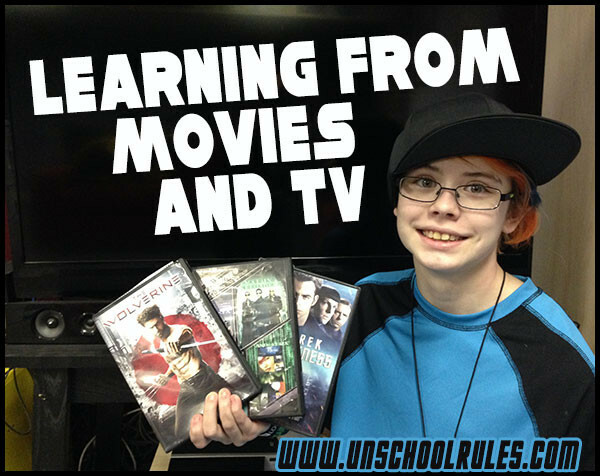 Movies and TV are a huge part of learning for me personally. I love Rent and Les Miserables. In terms of TV shows I would have to say that Buffy the Vampire Slayer is one of the most thought provoking shows I have ever seen. It deals with some pretty heavy stuff in later seasons. Otherwise I would say Game of Thrones, Doctor Who, Dollhouse , X-files, etc. I’ve also picked up how to write scripts, different kinds of cuts, and other stuff from reading the original shooting scripts from various shows. Oh, those are awesome suggestions! I haven’t watched many of those shows but my best friend likes Buffy a lot and he’s always recommending it. (I do LOVE X-Files too!) Thank you for stopping by – it is great to meet people who get it that this is a valid way of learning! HI Joan! I loved this post! ; not only because I’m a movie geek and love watching series, too since I was a kid, but because I know this is a great learning tool. We’ve watched many of the films and series you mention. We are really crazy about Community and we love The Big Bang Theory. We’ve talked a lot about what is to be called a “nerd” and what is really considered to be “intelligent” among other things. Paula, that’s AWESOME! I am so glad to share this in multiple languages!! This is fantastic. I am always trying to find movies that expand on what we are learning and your list is great. Thanks for sharing and I look forward to your blog. Michele, thank you so much! I hope you’ll keep checking in – when we post our monthly updates each month, I have a big movie list and I love sharing them! Hi Joan! I’ve been following your blog for a while now and I just had to comment on this really great post! I especially love your movie summaries. So much to learn here! I’m looking forward to following up on the resources you listed. I really admire your confidence in unschooling and I often find myself here when faced with a crisis in faith in our own unschooling, especially since we also have a “high school” age daughter. I look forward to your transcript post! Oh, Cassie, I’m so glad it helps! I’m just finishing up our official documentation for the year now, so the transcript post should be ready in the next couple of weeks after that! Keep checking! I’ve been homeschooling 3 kids for 11 years and I think this is my favorite post ever! Thank you! Andrea, thanks! That makes my day! Aww, thanks, Annie! You made my day!